When I began my research on the Tutankhamun exhibitions, I repeatedly came across one remarkable motif in the archives: quite a few of the remaining photos of the exhibition show the golden funeral mask of the famous ancient Egyptian pharaoh, the most important piece of the exhibition, facing at eye level a high-ranking representative of the country in which the exhibition was then appearing. These pictures call to mind a diplomatic meeting of two states or a state visit across time. Instead of the mandatory handshake between the two leaders, the photos give the impression of eye contact between the Egyptian mask and the queen of England or the presidents of the United States or the Federal Republic of Germany. The photos portray the Western leaders not as connoisseurs in the act of examining a work of art but as reverential admirers of a foreign leader. When the leaders are joined by experts, as in the photograph of President Jimmy Carter with the director of the National Gallery in Washington, John Carter Brown, the experts appear redundant. It looks as if Carter is not even listening to Brown but communing instead with Tutankhamun. 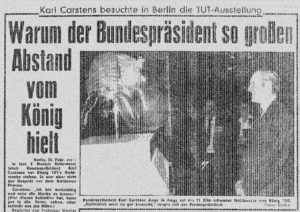 In Germany, this connection between the leader and the artifact was so evident that the popular tabloid Bild even expressed concerns about why the German president stood so far away from the mask during his visit. The explanation, that the president was farsighted, made it clear, nonetheless, that this was an intimate meeting between two leaders. All of these pictures suggest that Tutankhamun’s golden mask was more than just a beautiful, awe-inspiring artifact; it was an ambassador. There have been several exhibitions of objects from the tomb of Tutankhamun since its famous discovery by the British archaeologist Howard Carter in 1922. The best known, and the one of interest here, is the Treasures of Tutankhamun tour of 1972 – 1981. At first fifty and then fifty-five tomb artifacts were exhibited in the United Kingdom (London); in the Soviet Union (Moscow, Leningrad, and Kiev); in seven cities in the United States; in Toronto, Canada; and, finally, in five cities in the Federal Republic of Germany, where it was renamed Tutanchamun. The 1970s world tour is considered the most popular exhibition of all time, having broken records for attendance at almost every participating museum—records that for the most part still stand today. Especially in the United Kingdom, the United States, and Germany the “King Tut” show became a pop-cultural phenomenon: “Tutmania.” The exhibition received massive news coverage from tabloids and broadsheets alike. Even on TV, King Tut was everywhere. Although large-scale art exhibitions with hundreds of thousands of visitors had taken place as early as the mid-nineteenth century, the Tut exhibition was the prime example of a new exhibition genre. It became “the ultimate blockbuster,” as the director of the New York Metropolitan Museum, Thomas Hoving, wrote in his memoir. The exhibition was highly successful not only in terms of visitors and media coverage but also because it produced huge revenues for Egypt, which lent the touring objects, and for museums and tourist industries around the world. As such, the 1970s Tut exhibition is interesting on many levels: in its expression of a new exhibition boom, in its exemplification of the postmodern commodification of culture, and in the negotiation of the gender relations and racial identities that intersected in the course of the exhibition. In this essay I am concerned with the diplomatic dimensions of the blockbuster. News reports on the Tut exhibition often pointed out that the objects, and particularly the gold mask, were not simply museum artifacts but objects of ambassadorial status. The small German newspaper of Southern Schleswig explicitly headlined: “Tut—Egypt’s Special Ambassador.” Other newspapers celebrated the mask as the “King of Egypt” and representative of Egyptian state power. They reported on the way the mask was treated as a state guest, transported by the Luftwaffe (German airforce), and continually guarded by Egyptian and German security forces. 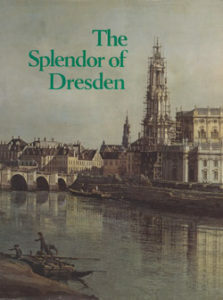 Schulze’s essay tells the diplomatic history of the Treasures of Tutankhamun touring exhibition, the most successful exhibition of all time, and its engagement in West Germany. It argues that the exhibition ascribed an ambassadorial role to its objects and used them as a tool of diplomatic propaganda. While the visit of the objects was promoted as an attempt at cross-cultural understanding, the interpretation and commodification of the exhibits also served to justify the West’s appropriation of Egypt’s natural and cultural resources. MARIO SCHULZE is a postdoctoral research fellow at the Zurich University of Arts. As member of the research group “Mobile Objects,” a project of Humboldt University’s Interdisciplinary Laboratory for Image, Knowledge, and Gestaltung at the Museum of Natural History in Berlin, he is writing a book on the Tutankhamun exhibitions. Today we do not expect poems to carry scientifically valid information — but this was not always the case. 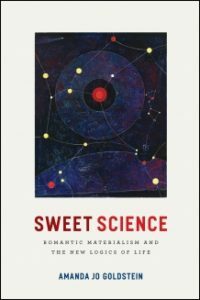 In Sweet Science: Romantic Materialism and the New Logics of Life (Chicago, 2017), Amanda Jo Goldstein explores how Romantic poetry served as an important tool for scientific inquiry. She argues that the work of authors such as William Blake and Percy Shelley makes a compelling case for poetry’s role in the perception and communication of empirical realities. Amanda Jo Goldstein is Assistant Professor of English at UC Berkeley specializing in Enlightenment and Romantic literature and science, with particular interests in rhetoric and poetics, pre-Darwinian biology, and materialist theories of history, poetry, and nature. A version of her Sweet Science chapter “Growing Old Together: Lucretian Materialism in Shelley’s The Triumph of Life” was first published in Representations in 2014. 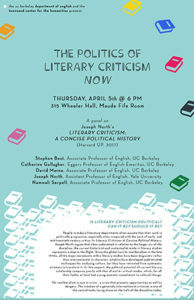 People in today’s literature departments often assume that their work is politically progressive, especially when compared with the work of early- and mid-twentieth-century critics. In Literary Criticism: A Concise Political History, Joseph North argues that when understood in relation to the longer arc of the discipline, the current historicist and contextualist mode in literary studies represents a step lo the Right. Since the global turn to neoliberalism in the late 1970s, all the major movements within literary studies have been diagnostic rather than interventionist in character; scholars have developed sophisticated techniques for analyzing culture, but they have retreated from systematic attempts to transform it. In this respect, the political potential of current literary scholarship compares poorly with that of earlier critical modes, which, for all their faults, at least had a programmatic commitment to cultural change. Yet neoliberalism is now in crisis – a crisis that presents opportunities as well as dangers. The creation of a genuinely interventionist criticism is one of the central tasks facing those on the Left of the discipline today.